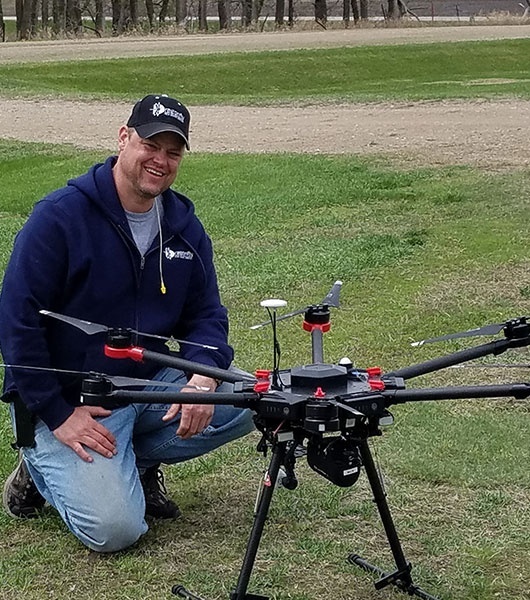 Dragonfly View Drone Service safely and professionally provides precision agriculture mapping services. Our main focus is collecting and providing multispectral data maps. The multispectral data collected is used by farmers, crop consultants and agronomists to produce more accurate field zone prescriptions with greater efficiency. The primary deliverables are Normalized Difference Vegetation Index (NDVI) maps, but we also can provide elevation and plant population maps as well as aerial inspection and photogrammetry maps. Using professional UAV (drone) services; a reduction in the time that inspection personnel need to spend on visiting the field and processing the results is realized. When a mapping mission’s flight has been well planned, a commercial drone can collect imagery or multispectral data that covers a field in a fraction of the time that it takes for manual inspection. Once the data is collected and uploaded, results are produced within hours compared to lab results which can take days or weeks. With all data and imagery collected during inspection flights, the point cloud created is geo-referenced with real-world geographic coordinates, the end result is maps and imagery that will be able to help identify areas of deterioration–before anyone needs to climb any ladder or scaffolding, undertake rope access procedures, walk on the roof, or access a muddy field. NDVI is a simple metric which indicates the health of vegetation. When near infrared (NIR) hits the leaf of a healthy plant, it is reflected back into the atmosphere. As the amount of chlorophyll produced in a plant decreases, less near infrared is reflected. This can be used to see the overall health of a crop. 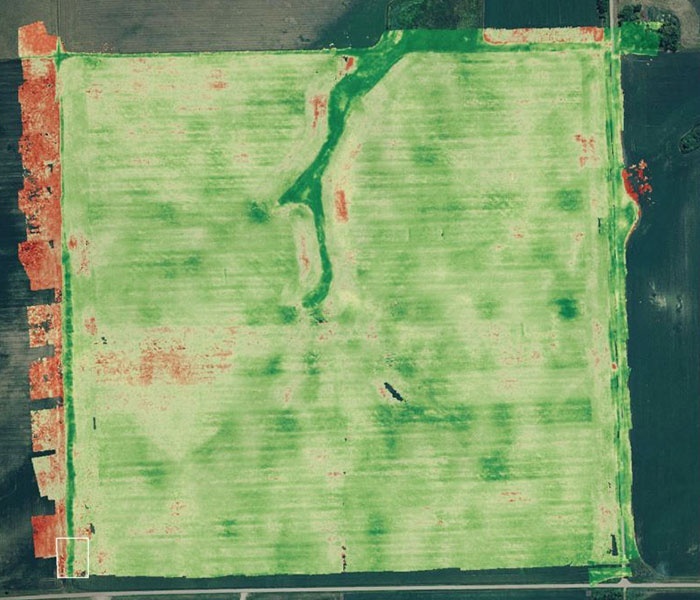 The NDVI algorithm compares the reflected intensities of near infrared and visible light. As variable rate applications are becoming a necessity, variable rate spreaders and sprayers need data input to tell them how much to put where; or, a prescription. The data for this prescription originates from either a satellite which typically has 30 meter resolution or from a drone with 30 centimeter resolution. The more precise the data, the more precise the results can be. Additionally, a commercial drone can produce results more reliably than a satellite or soil sampling alone because the fastest satellite orbits are only every 48 hours and is still limited by cloud cover and the soil sampling is limited to size of the fields grid. When soil sampling maps are combined with our drone data, a farmer or agronomist will be able to see the full picture of what is going on throughout the field. The NDVI map is comprised of every plant in the field. There are no gaps in coverage. Check in with us often! We’ll post information about upcoming events and opportunities to see our technology and services in action to this section.